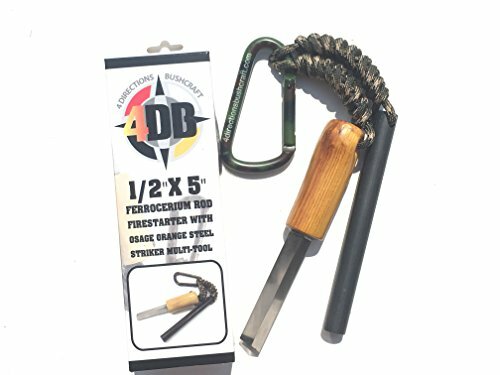 4DB 1/2"x5" Ferrocerium Ferro Rod FireStarter with Osage Orange Steel Striker Scraper Multi-Tool. • 4DB HSS strikers can be used in combination with the 1/2"x5" ferrocerium rod firestarter to cause showers of hot sparks easily when scraped due to their 4 very sharp 90 degree edges. • 4DB 1/2" x 5"″ Ferrocerium Rods throw gobs of hot dancing sparks for a lifetime when struck or scraped by the 90 degree edges of the 4DB Osage Orange High Speed Steel Striker. • Combined these two are very effective, efficient and reliable firestarters in all weather conditions and for easy use by just about anyone. • 4DB camouflage carabiner they are perfect for any Camping, Hiking Survival and Prepping Bag. (not rated for climbing. Ferrocerium offers a great combination of Magnesium, Cerium and Iron for easy reliable use and long life.